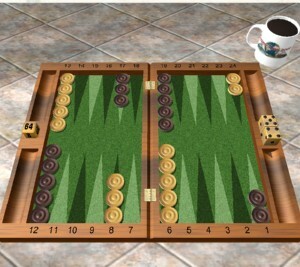 The aim of Backgammon is to be the 1st player to bear off all your 15 checkers. Players take turns rolling the dice and moving their checkers. The player who starts is chosen randomly at the beginning of each game. 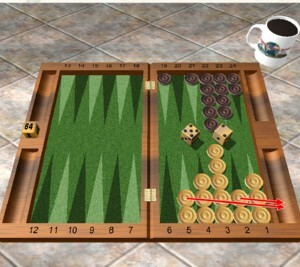 At the beginning of his turn, the player rolls 2 dice. He can then move his checkers according to the rules below. Note: Doubles thrown on the first roll are discarded and the dice re-rolled. The picture below shows the way the checkers move around the board. Note: The 2 players move in opposite direction. The dice are to be played individually, in any order. To move a checker using a die, move it the number of points shown by the die. A checker can not be moved to a point occupied by 2 or more of the opponent's checkers. Once the 1st die is played, the second one can be played. This completes the turn and the other player's turn begins. Click the image to see the final position It can move one of the 2 back man using the 4(not using the 5 first as the point is occupied by more than 2 opponent men). It can then continue moving this same checker using the 5 (as shown below) or move another one. If both dice can be played, the player must do so. If only one of the die can be played, the player must play the highest one if it's possible. 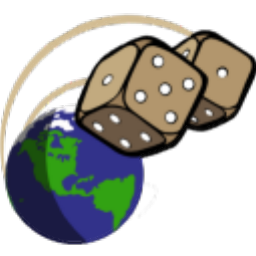 When a player rolls a double (both dice having the same value), the player must move 4 times. Click the image to see the final position When a checker moves on a point occupied by only one opponent checker, this checker is hit and moves on the central bar. Click the image to see the final position A player with checkers on the bar must enter them 1st before moving any other checkers. To enter a checker move it like if it was right outside the board. For instance Black rolls 41 and enter his checker from the bar using the 4 to the 21 point. he could have also enter in 24 using the 1. Click the image to see the final position When ALL of a player's checkers are on his last 6 points, he can bear off. To bear off, you have to reach an imaginary point located just outside of the board. To bear off one man, you need the exact dice to just remove it. This means that to bear off a man on the 3 point, you need to roll a 3. The farthest men can always bear-off, even if the dice is greater than the checker position. In the position below, if white rolls a 6, it can bear off the checker from the 5 point. If the opponent did not bear off a single man, the player wins a Gammon and 2 points. 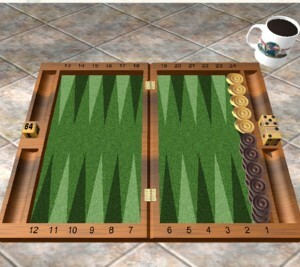 If the opponent did not bear off a single man AND has at least one checker on the bar or on his opponent's last 6 point, the player wins a Backgammon and 3 points. The cube is a die marked with the value 2,4,8,16,32 and 64. It shows the value of the current game. At the beginning of the game the value is 1 and the cube is positioned in themiddle of the board. At any point if a player thinks that he has an advantage, he can propose to his opponent to double the value of the game. This choice can be made only when it is his or your turn, before rolling his or your dice. Refuse the proposition: the game ends, and the player who doubled wins the current value of the cube. Accept the proposition: the game continues. The cube is put on its 2 face on the opponent side. Now only the opponent can decide to use the cube. If ever this player decide later to double, the player will have the choice to refuse and lose 2 points or continue with the cube at 4. When a player wins a gammon, he wins twice the value of the cube; for a backgammon, he will win 3 times the value of the cube. Note: you can not double on the very first roll. 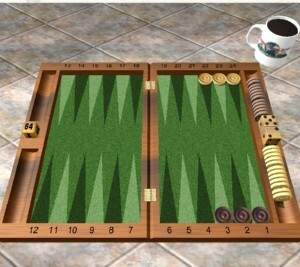 Backgammon is often played in "Matches". In a match, the aim is to reach a determined score, usually an odd number of points in a match). IMPORTANT NOTE: In any match, the final score does not matter when calculating elo--you receive the same amount of elo points whether you win a 5 point match 8 to 0 or 5 to 4. This mean that when playing a 1 point match, the gammons do not matter because the elo calculation is based upon the contract of a 1 point match. Doubling is not allowed as it would make no sense to double since that match was contracted for only one point. The Crawford rule is almost always used in match play. This rules says that when any player is only one point from winning the match, the next game will be played without any player being allowed to double. Note: In game 4 and 5, player 2 should double as soon as possible because he has nothing to lose (remember, that it's the same elo loss whether you lose 6-1 or 5-1). The Jacoby rule is used only when not playing a match (this kind of game is called unlimited or Money play). When using the Jacoby rule, no player can score a gammon or backgammon if the cube is still at its initial value. Like the Jacoby rule, Beaver and Raccoon are not used in match. When a player doubles the opponent has a 3rd choice: it can accept the cube "Beaver". It means the player redouble immediately but still keep the ownership of the cube. The player who initially doubled can refuse the beaver and lose 2 points, accept it and the game continue with a cube at 4 (own by the 2nd player) or even "raccoon" and proposed again to double the cube to 8 ! The variations included in GammonSite are HyperGammon, NackGammon and LongGammon. The rules of the game are the same--only the initial position changes. NackGammon:this variation has been created by Nack Ballard. It involves much more strategy. Backgames are more frequent in this variation. HyperGammon: it is played with only 3 checkers. The game is highly tactical. LongGammon: The strategy in this variation is very different from backgammon. Generally, it is best to try to establish a prime in your opponent's outer board.